You’re engaged — congratulations! Now it’s time to start thinking about save the dates, invitations and all the other elements of your stationery wardrobe. Here to help is Stephanie Helander of Helanders, who, along with her husband Casey, is the fourth generation in the 91-year-old family business in Lake Forest, Illinois. She graciously talked with us about what a bride-to-be should expect throughout the process of choosing her wedding stationery, from what she should prepare before that first appointment to who she should bring along for each appointment (yes, there are multiple). How far in advance should a bride make an appointment? She should make her first appointment as all the different parts of her wedding are coming together: as she’s looking for the dress and the venues, for example. She can start with the save the dates, as soon as she’s picked a date. Is there a best time of day or week to make an appointment? If she can take time out during the week, that’s best. It’ll give her more time to spend with the consultant and receive undivided attention. On weekends, there tends to be quite a few interruptions. However, we’re open on weekends to accommodate those brides who can’t make it during the week. Either way, making an appointment is best. Which months are your busiest? The busy season starts in January for summer weddings and goes through end of April. 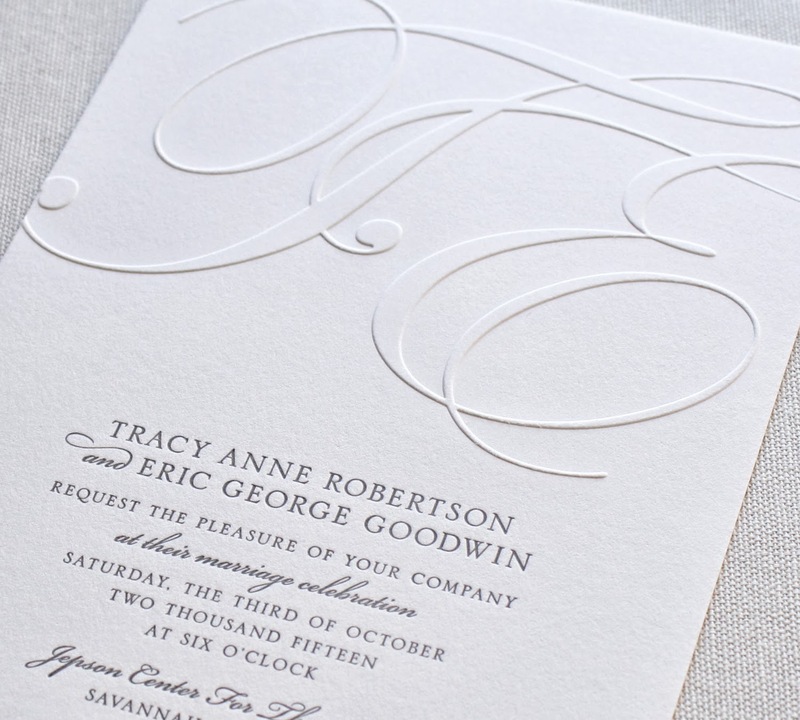 Go through the process from the first appointment to the delivery of the invitations. Twelve to nine months out, the save the date is chosen. Though it’s nice to match these to the invitations, it really isn’t necessary. Eight months out, brides should be looking at invitation styles and gathering ideas for their first appointment. Seven months out, the second appointment with the groom and/or other family members should take place. Five to six months out, the order for the invitations should be placed. Typically, the invitations will take four to six weeks for production. Three months out, they’ll receive their invitations and take them to the calligrapher (or have them printed another way) and two months out they should be in the mail. One month before the wedding they should receive their RSVPs. Hiring a calligrapher — do you suggest it? It depends on the bride. Usually more traditional brides will want calligraphy because of the detail and hand care. It’s an extra special layer. However, there are other options. Brides can have their envelopes printed in same typestyle as their invitations at a smaller cost. It’s a way to save money but also make everything still look cohesive. If cost is an issue, what are ways/areas where a bride can cut? Not using calligraphy. Understanding print methods — two-color engraving is quite expensive, while two-color digital is not. You don’t always need a reception insert card, and you can also combine invitations — if the families work together, perhaps the rehearsal dinner or the brunch can be mailed with the invitation — and use one single reply card for all the events. What should a bride bring with her when she comes? All information for her guests: correct spellings, facts regarding the what, when, where and how. I encourage brides to take a look on Pinterest. We’ll share boards with brides so they can see different looks, and she can share her boards with us so we can get a good idea of her style and what she wants before her first appointment. Who should she bring with her? All of the details — the folder with the venue information, proper spellings, times, dates, binder of contracts, swatches. Typically a bride goes through three appointments before making a choice. The first appointment is to just gather information. We want to open their eyes to the entire world. They want to see what’s different that they can’t find online, so we want them to touch and feel and walk through different styles. We’ll talk about pricing and we’ll build a budget. On the second visit, we’ll narrow it down to two choices, and this is the visit that typically the groom attends so we know he’s on board. Finally, the third visit is when the invitations are ordered. It’s a long process — a lot of details — so this is the visit the bride usually brings her mother to. Who should she not bring with her? The entire entourage. Mom or another significant person in their lives is best. Limiting opinions to those that matter is really important. What types of questions will you ask? We’ll ask about who’s hosting, the location and the feel of the wedding, because the invitation should portray that feeling. We’ll also ask about menu choices, reply cards, the religious aspects of the ceremony — the denomination of bride and groom and how that determines wording. It can get personal! What types of questions should she ask when she comes? If it’s important to her, etiquette — making sure they’re following rules. Also, making sure both sets of parents are on the same page and they know who’s hosting, because the invitation calls attention to that. What makes us so valuable is being able to balance what brides are seeing in the market with the mothers who might be more traditional. That’s where the art and the skill come through. Life's better with friends, so let's keep in touch. Follow us on Facebook and Pinterest!